See artworks by Judy Watson and get current prices online. 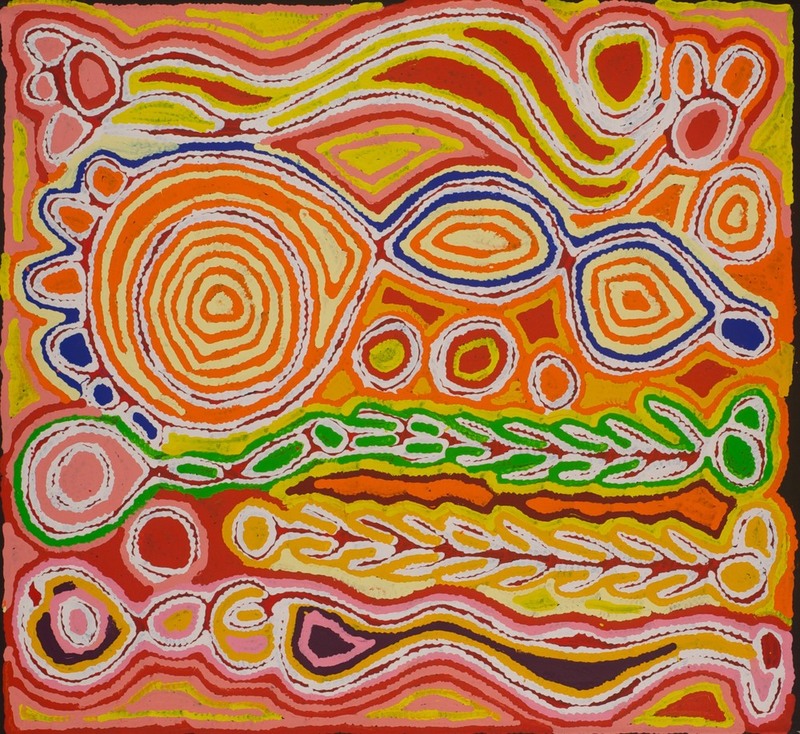 Amazing bursts of colour from the legendary Yuendumu artist, Judy Watson Napangardi. Browse artwork to rent or buy from Wentworth Galleries online now. Judy Napangardi Watson (circa 1925 - 2016) was a senior painter from Yuendumu in the Northern Territory of Australia. Very distinctive in her style, she was a groundbreaking artist known for using an amazing palette of colour. An incredibly energetic woman even late in her life, she started painting with her sister Maggie Watson who taught her to paint. It was the 1980’s when Judy Watson Napangardi started to paint with her sister, Maggie Watson. Judy quickly developed her own her style; a dragged dotting effect creating beautiful line and texture in her work. 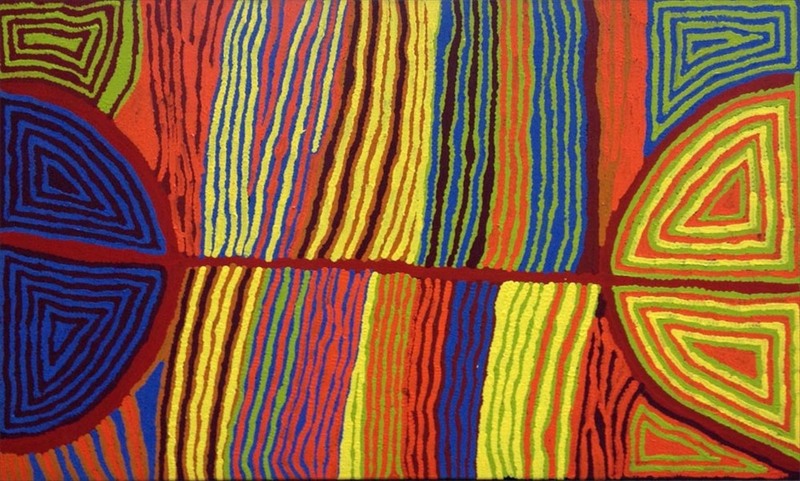 Vivid colours and instinctively brilliant composition pushed her to the top of the Australian Aboriginal art scene. Judy was born at Yarungkanji, Mount Doreen Station early in the 20th century - at this time, many Central and Western Desert Peoples were living a traditional nomadic life. Walking long distances is a big part of life for the nomadic peoples of this region and Judy made many trips on foot to her country spending a lot of time at Mina Mina and Yingipurlangu, her ancestral country on the border of the Tanami and Gibson Deserts. Bush tucker is plentiful in these areas. Judy frequently went hunting in the country west of Yuendumu. 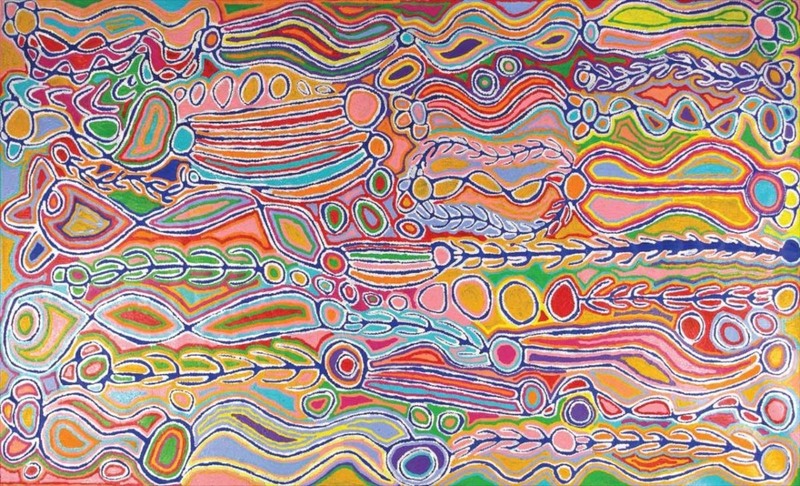 Most of her works depict the area of Mina Mina or the traditional dreamings of the region - the most popular of her dreamings was Ngalyipi (Snake Vine). She died at Yuendumu on 17 May 2016. Judy Watson Napangardi 180cm x 305cm 'Mina Mina' (#10403)- This extraordinary piece has the colour and scale bring a large room to life!